In By the Numbers, FADER looks at a big record release and breaks it down in basic digits. 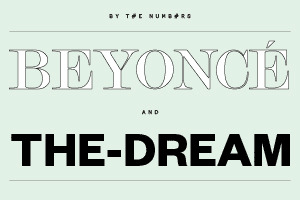 This week, taken from the magazine's forthcoming 86th issue, we tackle frequent co-conspirators Beyoncé and The-Dream, who've both got new LPs this year. The-Dream's, IV Play, is out now.